The popularity of GIFs on the social network is unrivaled. From dance moves to sloths, Giphy has you covered, and now it’s easier than ever to make your own. Twitter claims that people shared over 100 million GIFs in tweets and direct messages in 2015 alone. Anvil was inspired by the idea after seeing the popularity in fast-paced Twitter Chats. The dance-off itself was planned off the cuff, and Anvil had one day to gather the team to plan and film dance moves after making the announcement. Our team then created original GIFs. We invited a few key influences including Moz, Buffer, Hootsuite, and SproutSocial to participate. 56 users used #GIFDANCEOFF between May 4th and May 6th. Another 549 users participated with #DANCEOFF sending 697 posts with a potential 25,901,123 impressions. #GIFDANCEOFF earned 16,056,357 impressions in 1 day. 56,180 organic impressions on @AnvilMedia tweets. All around engagement was a complete success. Tons of fun for Anvil team members and the entire community involved. Stay tuned for round two coming soon, and thanks to everyone involved in the first one. 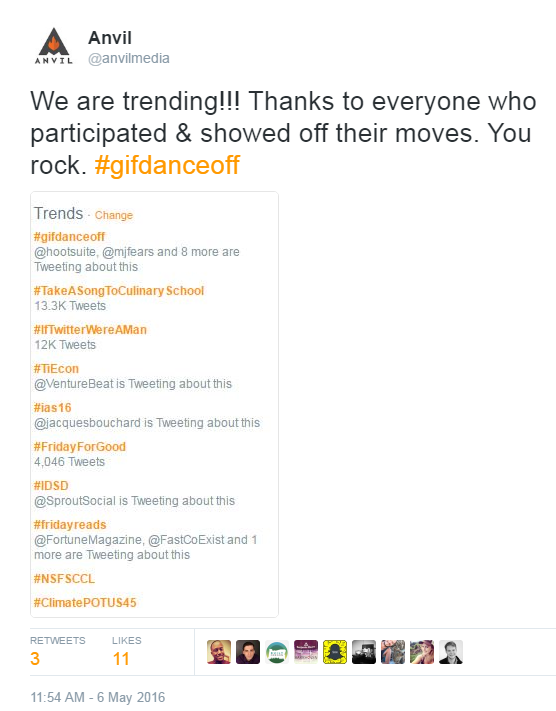 Here are some of our favorite tweets from #GIFDANCEOFF.